August 2018 Game of the Month - Go! Go! Gooble!! It's been a while since we've written a Game of the Month topic, and Go! Go! Gooble!! gives us an excellent reason to revive this feature! Q-Nova's latest minigame is one of the relatively rare Super Mario Sunshine fangames on MFGG. 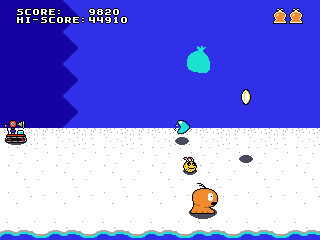 In this game, you control a Gooble - the goop-spreading blobs from Sunshine. You're on the run from the Delfino Plaza police force that want to put an end to Delfino's graffiti problem! You try to survive as long as possible while collecting coins and Shines. You earn points for collecting these goodies, and you also get a bonus for each second you survive. At first, the game is simple - you only have to dodge the Fluddroid that's trying to give you a permanent bath. However, as the game progresses, you'll encounter new enemies and obstacles in your path! Most of the graphics are made by Q-Nova himself, and it's always nice to see fangames with distinctive graphical styles. The game also includes an online high scores system, which greatly enhances the game's replay value. If you're looking for a flood of fun, I encourage you to give Go! Go! Gooble!! a go. GOTM topics are now back to their monthly schedule, but we're tweaking the format: In even-numbered months, we'll choose a recently-released game that's well-made and creative. In odd-numbered months, we'll invite the community to nominate games for the GOTM, regardless of how long it's been since the game has been released. We hope this new format will continue to reward members who contribute awesome games, as well as giving us an opportunity to recognize fun games that might have fallen under the radar. Yes! It feels great to win another GOTM award after nearly three years, and it's also nice to see GOTM topics make a comeback! It's good to see that my game still has a distinctive look even with a different art style. One thing I want to point out in your writing, @VinnyVideo, is that it's not the Hotel Delfino police force that sent out the Fluddroid, that's from the Delfino Plaza police (I don't think the hotel even has a police force at all). Aside from that, I will say that it's kinda funny that a Super Mario Sunshine fangame won a GOTM award, since I used Sunshine itself to demonstrate a new GOTM banner design (which is used for the banner in this topic). Also, rumor has it that something special awaits those that managed to get above a certain amount of points. According to the online high score table, nobody (besides me) has achieved that yet. @Q-Nova Good catch! And fixed. @VinnyVideo Much better! Anyway, I think this should also be in the announcements box on the index page, right? I think a GOTM banner was put into that box during when the MyBB forums were being tested out. Also, do you have any idea on when will we start nominating games for September 2018 GOTM?